Whenever I thought of the Liberty Bell I always thought of it as this grand relic of history, protected and preserved. I thought it would be hanging on wooden beams in it’s original place, maybe in a tower. I thought for sure there would be bullet-proof glass surrounding it and a burly security guard with a sourpuss. Instead there was some velvet rope and the only security measures were that 100-200 or so people were allowed in at a time and they search your bag for firearms and other stuff before you enter. And yet people flock to see it, we had to stand in line for 20 minutes! And for what?! It was so unimpressive… and small! I thought it was going be huge, nope, it is tiny. 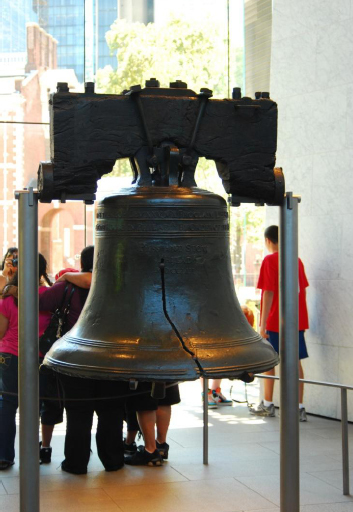 Quite frankly, the Liberty Bell is not all it’s cracked up to be.